Kurnool: Students of G Pullaiah Engineering College has come up with a new solar car which could help prevent atmospheric pollution. College chairman GVM Mohan Kumar said that it will be useful mainly in rural areas to serve local needs. According to Mohan Kumar, earlier, the students had successfully designed a new solar cooker with the Rs. Rs.50000 funding provided for this purpose by the Institute of Engineers, India. Following this invention, the students designed the solar car at a cost of Rs 1.2 lakh. 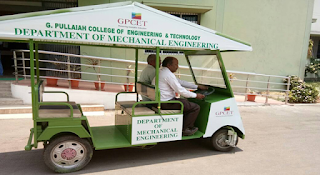 Dr K Mallikarjun, Head of the Mechanical Engineering Department, said the students - Nirmal Kumar, Ashish, Hussain Basha, Sainath Goud, Ranjith, Anil and Yogesh - formed a group and worked hard for four months to develop the car. The solar car, which has a maximum speed between 35 to 40 Kmph, could run up to 150 km when charged fully. The cost of production of this car is Rs 70,000.